But now I can't seem to figure out the folder structure for the new one. Can anyone help? 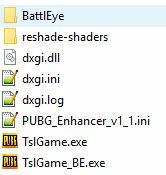 PUBG_Enhancer_v1_1.ini being the presets config file. Last Edit: 1 year 10 months ago by Evan20xx. With ReShade 3, the presets aren't stored in individual config files like older versions. The entire preset is in a single .ini file. Also, Reshade's shaders now store the individual default values for each shader in the shader itself, making pointing to each shader's configuration moot. So, in acknowledgement of that, wouldn't it be coded as below? Instead of having separate "pointers" to each .cfg file (that no longer exist for ReShade 3), wouldn't having a single "pointer" for each preset work, or can this be eliminated altogether since we already pointed to the preset? (My guess is no, since he isn't reading the preset values in fields 351-393). If my assumption is correct, would the following be likely the correct solution? Last Edit: 1 year 3 months ago by jminternelia. GW2Hook a version of ReShade built for GuildWars2, has this function. Maybe try and contact him. Been trying to get Different SFX or ReShade Presets For Each Location working on reshade v3+ and I've seen your solution and I want to try it but I have no idea where to put the .cpp file. Does anybody know where?